The race to develop autonomous technology has led to the fast-growing rise of autonomous or self-driving cars. Automakers, technology companies, startups, and even governments are getting involved. So how do these self-driving cars actually work? Each automaker uses different technology for their cars, but these cars use either computer vision-based detection or laser beams to generate a 360-degree image of the car’s surrounding area, multiple cameras and radar sensors measure the distance from the car to various objects and obstacles, and a main computer analyzes data, such as size and rate of speed of nearby objects, from the sensors and cameras and compares its stored maps to assess current conditions and predict likely behavior. The cameras also detect traffic lights and signs and help recognize moving objects. Automakers such as Tesla, General Motors, Toyota, Lexus, Ford, Fiat Chrysler, Honda, Volvo, Volkswagen, and technology companies such as Google, Apple, nuTonomy, and Intel have all joined in the race to develop self-driving cars. This push may be caused by Uber, which is a “digital hybrid of private and public transport” and has made “ride-hailing” so comparatively convenient and cheap that it threatens the car ownership industry. Further, with technology becoming increasingly integrated in and almost detachable from consumer life, self-driving cars are efficient and convenient, allowing the “driver” to interact with their phones and other technology while safely getting to their destination. In 2016, Uber’s self-driving truck made its first delivery, driving 120 miles with 50,000 cans of beer, changing the future of truck driving and deliveries. Later that year, Uber also tested its autonomous driving technology in San Francisco until California’s Department of Motor Vehicles revoked the registrations for sixteen Uber cars for not marking the cars as test cars. However, Uber contended that their cars do not need self-driving car permits because they were operated with a “safety driver” behind the wheel as the cars’ programming still requires a person behind the wheel to monitor the car and works more like advanced driver assist technologies, like that of Tesla’s autopilot. The revocation of the registrations may have been made in light of the deadly crash of a Tesla’s Model S, which is not a self-driving car but contains self-driving features to assist drivers. Tesla ultimately attributed this accident and two other accidents to “human error, saying the drivers 1) were inattentive, 2) disabled the automation and 3) misused the Summon feature and didn’t heed the vehicle’s warnings.” Unlike Tesla’s autopilot, which focuses on driver assistance, Google’s Waymo is focusing on creating a fully autonomous car but has not put them on the market. Some self-driving cars have already hit the market, and expectedly, there is a push for national self-driving vehicle regulation standardization. The United States Department of Transportation (DOT) released its Federal Automated Vehicles Policy in September 2016, setting guidelines for highly automated vehicles (HAVs) and lower levels of automation, such as some of the driver-assistance systems already deployed by automakers. The policy guideline includes a 15-point safety assignment to “set clear expectations for manufacturers developing and deploying automated vehicle technologies,” a section that presents a clear distinction between Federal and State responsibilities for regulating automated vehicles, and current and modern regulatory rules. Combined with the recent guidelines, the DOT also issued proposed rules for cars to talk to each other to prevent accidents to “illustrate the government’s embrace of car-safety technology after years of hesitation, even as distractions in vehicles contributed to the biggest annual percentage increase of road fatalities in 50 years” and attempt to fix vehicle deaths and reduce crashes. The cars would use radio communications to send alerts to devices in the cars to warn drivers of risks of collisions, presence of a car in a driver’s blind spot, presence of oncoming traffic, and traffic slowing or stopping. Although the DOT invoked some standardization, they say nothing about “how it is tested (or even defined), how cars using it will operate, or even who should settle these questions.” On February 14, 2017, the House Subcommittee on Digital Commerce and Consumer Protection held a hearing regarding the deployment of autonomous cars where representatives of General Motors, Toyota, Volvo, and Lyft provided testimony about how the parties think the federal government should regulate the new technology. Automakers and technology companies developing autonomous technology want federal intervention to provide a “broad, consistent framework for testing and deploying their robots,” fearing states creating a “patchwork of regulations.” Federal regulators would allow greater flexibility and wide latitude in how to prove the safety of the autonomous driving technology. Congress will have to decide how to measure the safety of these autonomous cars and dictate the standards of safety they must have as the age of the robocar and its transition into consumer lives seems to be an inevitability. Matt McFarland, 2016: A tipping point for excitement in self-driving cars, CNN Tech (Dec. 21, 2016), http://money.cnn.com/2016/12/21/technology/2016-year-of-autonomous-car/ (last visited Feb. 18, 2017). 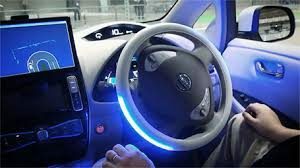 See Guilbert Gates et al., When Cars Drive Themselves, NY Times (Dec. 14, 2016), https://www.nytimes.com/interactive/2016/12/14/technology/how-self-driving-cars-work.html?_r=0 (last visited Feb. 18, 2017). See John Gapper, Why would you want to buy a self-driving car?, Financial Times (Dec. 7, 2016), https://www.ft.com/content/7fad3a62-bb06-11e6-8b45-b8b81dd5d080 (last visited Feb. 18, 2017). See Alex Davies, Uber’s Self-Driving Truck Makes its First Delivery: 50,000 Beers, Wired (Oct. 25, 2016), https://www.wired.com/2016/10/ubers-self-driving-truck-makes-first-delivery-50000-beers/ (last visited Feb. 18, 2017). See Avie Schneider, Uber Stops Self-Driving Test In California After DMV Pulls Registrations, NPR (Dec. 21, 2016), http://www.npr.org/sections/thetwo-way/2016/12/21/506525679/uber-stops-self-driving-test-in-california-after-dmv-pulls-registrations (last visited Feb. 18, 2017). See U.S. Dep’t of Transp., Federal Automated Vehicles Policy: Accelerating the Next Revolution in Roadway Safety (2006), available at https://www.transportation.gov/sites/dot.gov/files/docs/AV%20policy%20guidance%20PDF.pdf. See Cecilia Kang, Cats Talking to One Another? They Could Under Proposed Safety Rules, NY Times (Dec. 13, 2016), https://www.nytimes.com/2016/12/13/technology/cars-talking-to-one-another-they-could-under-proposed-safety-rules.html (last visited Feb. 18, 2017). See Alex Davies, Congress Could Make Self-Driving Cars Happen—or Ruin Everything, Wired (Feb. 15, 2017), https://www.wired.com/2017/02/congress-give-self-driving-cars-happen-ruin-everything/ (last visited Feb. 18, 2017).